Hyderabad Runners Society and Bharti Airtel together with the Govt. 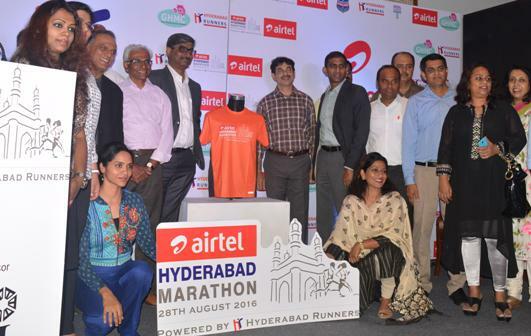 of Telangana announced the launch of the 6th Edition of the Airtel Hyderabad Marathon. The Government is supporting the annual sporting event organized by the Hyderabad Runners Society, which is celebrating its 10th year of promoting healthy lifestyles with running. The 2016 edition of this annual sporting extravaganza will be held on 27th & 28th August with active participation expected to be 16,000 runners. Considered to be among the leading & toughest city marathons in India, this sporting event also marks the beginning of the Marathon Season in India and aims to bring the 425 year old historic city of Hyderabad alive!! Mr. Jayesh Ranjan, IT Secretary, Information Technology, Electronics & Communications Department, Government of Telangana, Mr. Venkatesh Vijayraghavan, Chief Executive Officer, Bharti Airtel - Andhra Pradesh & Telangana, Dr. Murali Nannapaneni, Race Director, Airtel Hyderabad Marathon were present at the event. As one of the most popular and highly rated marathons in India, returns for the sixth year, over 19,000 runners, health & fitness enthusiasts, volunteers, medical personnel, city officials and police will come together and energize this sporting extravaganza with a curtain raiser – 5K Run on Saturday August 27th and on Marathon Sunday - August 28th 2016, the 10K, Half Marathon (21.095 km) & Full Marathon (42.195 km) will take place. Announcing the registrations open, Mr. Venkatesh Vijayraghavan, Chief Executive Officer, Andhra Pradesh and Telangana, Bharti Airtel said, “We are proud to be partnering with the city’s annual flagship running event for the 6th year. Airtel Hyderabad Marathon has created a world-class sporting extravaganza by connecting runners, communities and people at large through the transformative power of sports for the last five editions. The marathon is a personal journey for everyone who participates and it’s inspiring to see citizens of the city of Hyderabad embrace this event as an annual carnival. We encourage everyone to be a part of this mega event as participants or as cheer groups and lead the participation drive among family and friends”. Hyderabad Runners, the event organizer, aims to promote running as the preferred form of fitness to achieve active & healthy lifestyle. The Full and Half Marathon covering a distance of 42.195 kms and 21.095 kms will traverse the important landmarks in the city giving the runners a picturesque view of the Hussain Sagar Lake, IT & Knowledge hub of HiTec City & Gachibowli while spreading the healthy lifestyle theme among Hyderabad denizens. The members dedicated its endeavour to inculcate community running culture in the city and roping in people from all walks of life. The baby steps covered shorter runs before the half and full marathons made their place on the map. In the rest of the geographies, it offers 2G, 3G and 4G wireless services and mobile commerce. Bharti Airtel had over 361 million customers across its operations at the end of May 2016.